Originally the Servicemen’s Readjustment Act of 1944, known as the GI Bill, was created to provide benefits for returning WWII Veterans. These benefits included low-cost mortgages, low-interest loans to start a business, tuition payments of tuition and living expenses to attend a university, high school or vocational education. In 1973, the Veterans Educational Assistance Program and Montgomery GI Bill was enacted to induce enlistment in the military (which now is voluntary). Veterans received assistance from 1976-1987 through the two bills. In 1985, the Montgomery GI Bill expanded and replaced the Veterans Educational Assistance Program for those who served after July 1, 1985. In 2008, the Montgomery GI Bill again expanded. It was at this time the Veterans Administration (VA) began to manage the benefit internally rather than using an outside contractor. 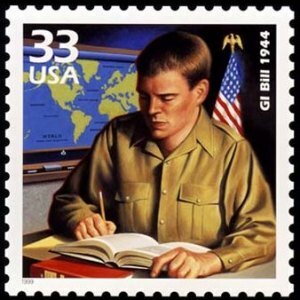 In December of 2010, the GI Bill evolved into the Post-9/11 Veterans Education Assistance Improvements Act of 2010. This bill expanded eligibility to include members of the National Guard (full-time Active Guard and Reserve), however still excluding Coast Guard Reserve. The new GI Bill includes items such as enrollment periods, Spousal GI Bill eligibility, and changes in tuition cap. Active Duty: 90 days of aggregate Active Duty Service after Sept 10, 2001 and are still on active duty. Veteran: Honorably discharged or were discharged with a service-connected disability after 30 days. Payable for 15 years following your release from active duty. For profit colleges have been targeting GI Bill recipients aggressively. These for profit colleges include many household named colleges. These for profit colleges high costs are causing GI Bill recipient’s to completely deplete their GI Bill Benefits. Though VA has put a tuition cap on for profit tuition benefits, GI Bill recipients are not often told the total cost of tuition, books, etc. and are forced to take out student loans. Many of the student loans GI Bill recipients receive are done so without knowledge or consent, causing higher rates or defaults on those student loans. Between 2009 and 2011, institutions like the University of Phoenix and DeVry took 37% of GI Bill educational funds, resulting in only 25% of veterans being education. Graduation rate at private for-profit institutions is only 28%. “At 8 of the 10 for-profits that take in the most GI Bill cash, more than half of students drop out within a year of matriculation.”  If those GI Bill recipients choose to transfer to another school, they are also finding that credits from many for profit schools will not transfer to private schools or non accredited institutions.